I went to Watkins Glen for a day. Well, an evening actually. I was passing through the area with my family on the way home from Lake Placid and we stopped to check it out. I do think that this is a very beautiful place but I was coming home from a very amazing trip including tons of breathtaking views and I honestly think that swayed how I felt about. It was fun and I would like to go back to get a second perspective on it. But after Lake Placid I wasn't as captivated of it as I expected to be. Although, maybe I wasn't as blown away because of all of the hype surrounding it. I went and enjoyed it but I wasn't thinking much about it after we left; nor was I talking about it too much when recapping the trip. I think that's why it's taken me a month to write this post. I want to share about it. I want people to go and have an amazing experience of their own. I just don't know what to share about mine. I feel like I should sit down and write about how beautiful, amazing, and captivating the experience was. But that's not what it was for me and I don't want to fake it to make it look good. I also don't want to paint a picture to make it look bad either. I think I just need to make a point of saying that social media is not always what it seems. We all know this, but reminders are always good. When you see travel pictures as you're sitting in your kitchen or at your desk at work you think to yourself how "lucky" that person is to be having such an amazing time doing something that looks so cool. But you don't know the story behind any of it. You don't know that I dropped my external battery while trying to take a picture and that my phone is so old and doesn't work without being constantly charged. So I was out of a phone pretty much completely for the next two days. You don't know that we did this hike in the evening, finishing up around 8 p.m. and not yet having dinner. We went to a restaurant and I was so hungry that I thought I was going to pass out so I sat there and ate the lemons in the water while my mom ran (literally) to the car to grab me a snack. You don't know that we didn't have a hotel booked for that evening and had to try to find one on the way to our next destination which if you've ever done that, then you know it's typically a fiasco. There's so much that goes on behind photos, stories, and social media experiences. I'm not saying to think that everyone is having an awful time when it looks fun. But things can be curated to be whatever the person wants them to be. I could sit here and go on and on about how you need to book a trip to Watkins Glen right now. It wouldn't feel right to me though because that's not the experience that I had. I think that we need to all work a bit more on being present and following our own drive. If you look at photos of something that looks cool to you online, go! If you find something that everyone else claims as amazing but doesn't look too amazing, maybe still go and check it out or go somewhere that excites you. Follow your own path and feelings. If something doesn't light you up and you feel like it "should have," stop feeling guilty for your own experience. That's simply what all of life is; a collection of experiences that we all have individually and we try to combine them collectively. Sometimes it works and connections are made. Other times it doesn't and we have an experience to reflect on. I think that we can just as easily become connected to places as we can people and I just don't think that I clicked with Watkins Glen like I somewhat expected to. But you know what, that's totally okay! I can go back someday with no expectations and see what happens then. Letting go of the expectations that we place on locations, people, experiences, etc. leaves little room for magic to happen. We build these things up in our heads to be something that could leave us with a completely different experience if we just dropped the prior story that we create in our minds. Moral of the story: go to that place that you had an okay experience, but this time without judgment or expectations. See if you have different things come up when you're there. We are all so unique, but so connected. By being open to anything that wants to present itself, we allow ourselves to create true connections and genuine experiences. 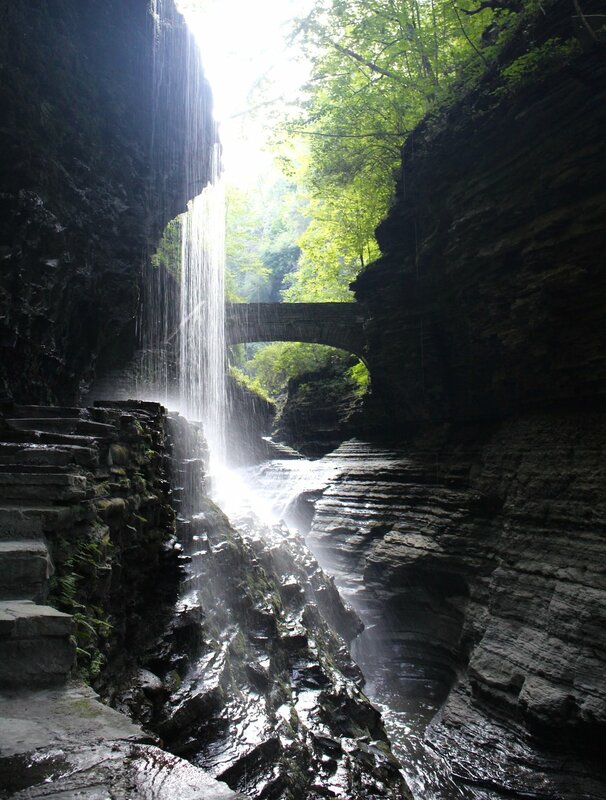 I'll be back to Watkins Glen someday to try it out. Until then, I can work on it right where I am, too.